A vegetarian soup that’s so comforting you’ll want to make a batch to eat all week long. There are some dishes that are just so comforting, we can’t help but dig up the recipe each year as soon as the cool autumn air rushes in. This lightened-up, creamy corn chowder is filled with all kinds of fresh veggies, just the right amount of spice and a rich, flavourful broth, so it’s bound to be one of our favourite fall go-tos from now on. During sweet corn season it is perfectly acceptable to enjoy corn no other way than on the cob with salted butter and black pepper, but if you should ever tire of that delight, this soup needs to be first on the list to make. 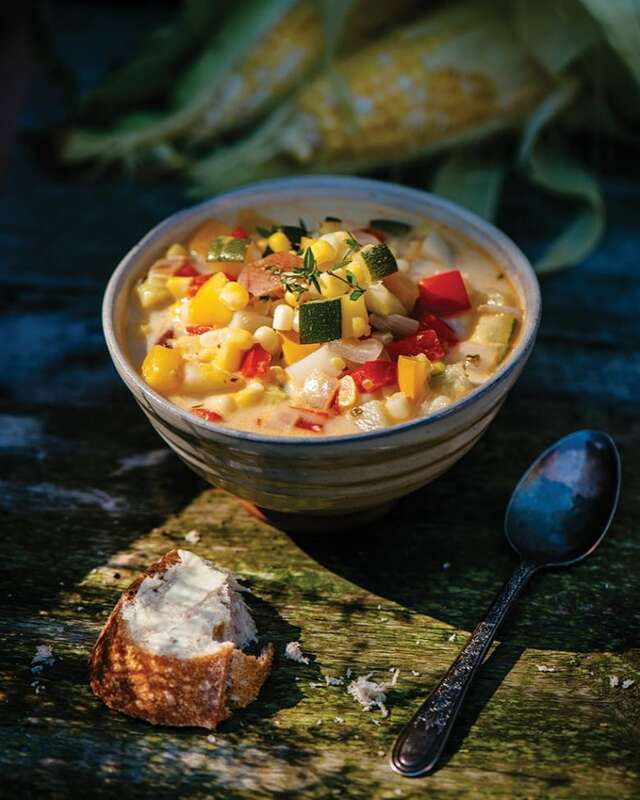 It’s a lighter version of corn chowder, packed with the best vegetables of the summer season. You won’t even miss the bacon — honest! — because this soup bursts with fresh flavour, thanks to a homemade corn stock that uses the leftover cobs. The fresher the corn, the sweeter it is, so try to buy your cobs on the same day you intend to make this soup. Also, the chowder is vegetarian and gluten-free and can be adapted to be vegan if the cream is replaced with a little coconut or cashew milk; either would be delicious. Working with one ear of corn at a time, wedge the pointy end into the hole of a Bundt pan. Holding the top of the cob firmly, use a knife to slice from top to bottom, letting the blade run right along the cob. The kernels will fall into the Bundt pan for easy collecting. Reserve the kernels. Combine the corn cobs, 1 sprig of thyme, bay leaf, garlic and water in a large pot. Add a fresh Thai chili if you want a spicy stock. Bring to a boil, then reduce heat to low and simmer, uncovered, for an hour. Strain stock and discard the solids. Use at once or store for up to 5 days in the refrigerator. In a large pot, warm the olive oil over medium heat. Add the onion and cook for 5 minutes, stirring occasionally. Meanwhile, slice zucchini lengthwise into quarters, then thickly slice. Halve, seed and chop the red pepper. Add the zucchini, red pepper and remaining sprig of thyme to the onion. Cook for another 5 minutes, stirring occasionally. Pour in about 2½ cups (625 mL) of the corn stock and add potatoes. Simmer chowder over medium-low heat for 15 minutes, or until the potatoes are tender. Add reserved corn kernels, cream, salt and pepper. Simmer until piping hot, about 5 more minutes. Remove the thyme sprig and serve. Excerpted from The Simple Bites Kitchen, copyright © 2017 by Aimée Wimbush-Bourque. Published by Penguin, an imprint of Penguin Canada, a division of Penguin Random House Canada Limited. Photography by Tim and Angela Chin.